When you start a farm, there’s no definite starting point. Well before you ever have plants in the ground or animals to graze, you’re already deep into planning and dreaming. By the time we moved home from New England, we already knew (roughly) what we wanted to raise and where and how we wanted to sell our food. 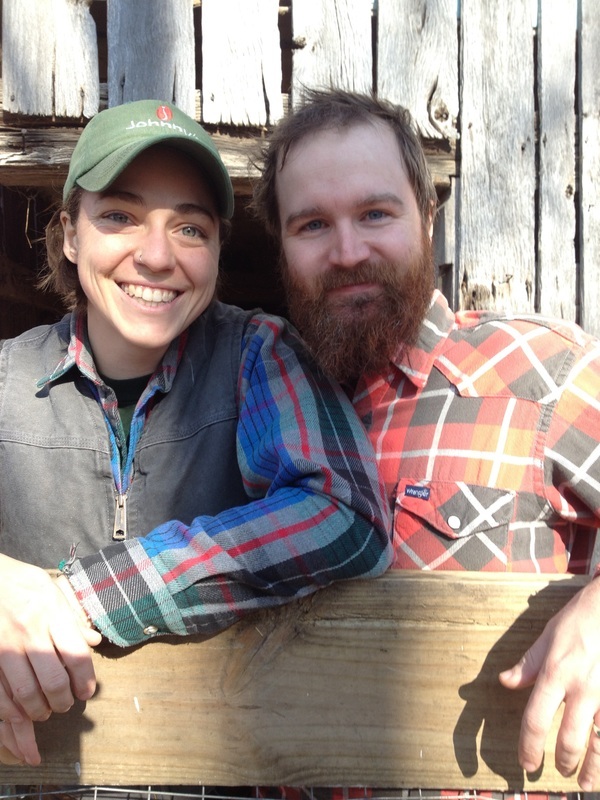 But for us, it was naming our farm that felt like the beginning. We had been kicking around three different names for our farm, but even after polling our friends there was no clear winner. At that point, we realized that there was no clear winner because no name stood out as distinct or closely represented our personalities. After all, farms take so much work and decision making that they tend to reflect their farmers. Since we were starting from scratch on the naming process, a college friend who is now a librarian recommended that we sit down with a bourbon and a book of Wendell Berry poetry, saying we would definitely find our name if we did that. We found a poem that describes the satisfaction enjoyed at the end of a day’s hard work, with the line “ahead of nightfall birds sing.” Not what we expected, but we fell in love and had a name for our life’s work. As much as I wish naming our farm was the hard part, our work was just about to begin! We were taking over part of the family farm that had been rented out for annual row crops, so since it was winter that meant we were starting with a blank slate. We border the Muscatatuck River, we sit wet, and we had very little organic matter in our soil, so the fields helped us make a few decisions that first year. Transitioning away from annual row crops, we figured the soil wanted some attention before we planted the perennial pasture that we would rely on for years to come. We planted two rounds (a spring and a fall) of cover crops designed first and foremost to address the needs of our soils. Some plants fixed nitrogen, some drilled holes with their taproots to address compaction, and some grew to be huge in order to leave a lot of plant material behind and start to increase the organic matter in our soil. Each of these plants would also act as forage for our first season’s animal groups. Because moisture is such an issue for us, we knew that we wouldn’t be grazing cattle (because they are heavy animals, they would quickly churn our fields into mud-butter). That first year, we started with monogastric animals (animals with one stomach, like us, that can’t thrive on forage alone—we would feed them a grain ration in addition to grazing on the cover crop rather than relying on our as-yet non-existent pasture for food). Chickens are a quick turn-around, pigs are delicious and an easy starting place for building relationships with customers looking for good, pasture-raised meat, and turkeys put our farm at the center of our customers’ holiday celebrations. These animals don’t rely on the pasture as their sole source of food, but boy do they eat from what grows! Our pigs were cleaning their plates, eating roots, stems, leaves and flowers. The chickens ate their fill of grasshoppers and seed heads off of the plants, and the turkeys preferred the leaves. Our field had only ever been row crops (at least for the last few decades), so we had no fences and no water access. We were committed to rotational grazing, so we move our animals using temporary electrified nets. We didn’t have electricity, so we used solar chargers to energize the fences. We were lucky to find an old hay wagon in one of the barns (no one in the family remembered that it was there; it was covered in 30 years of junk! ), so we filled a 200-gallon tank from our home’s well and parked it near our animals. A good farming friend told us (right as we were starting our farm!) that she wouldn’t wish the first year of a farm on anyone. 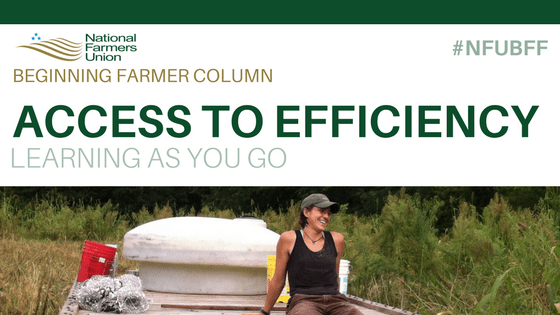 I don’t totally agree, but it is quite hard to not have established systems for the multitude of tasks that are required to keep a farm running. Figuring out how to keep your records, where you’ll buy feed from (and then where you’ll keep it), who has feeder pigs available when you need to buy pigs, getting the slaughter dates that you need, finding customers to buy your products—honestly, it’s a never-ending list that fortunately gets a bit easier as you go. For us, it has been getting easier. We put in a high tensile fence to carry power to our temporary nets, we put in a well and pipeline so water is only a hose away and we’re not carrying it in buckets (which is huge! ), we planted a perennial pasture, we added sheep once we had enough pasture forage to feed them, and we have expanded our markets and our number of animals. We’re starting season five right now, and find ourselves growing and taking over another two fields—meaning starting from scratch again! This time around, we have more experience and a better idea of what we need, so hopefully it’s a bit easier. And this time we’ve already got the markets and a pasture and the relationships needed to make the farm work. Another farming friend told us that every year is like the first year of farming, since so much changes with the weather and the markets etc. You always have to trouble-shoot problems and find new solutions. I also don’t totally agree with that, since you are more experienced each year, but it is true that there are always new challenges. Here’s to treating each season as a chance to learn and grow … and to getting better as we go.